THE Gladstone region holds a sentimental place in the hearts of the Engelston family. 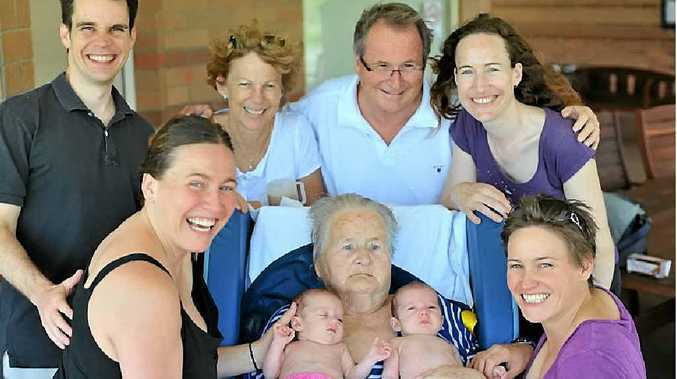 Travelling from America, Brisbane and Melbourne to reunite four generations, the Engelston family members were ecstatic to return to the region that holds so many special memories. Third-generation Engelstons Michelle and Stephanie reminisced about their childhoods, when many days were spent on the banks of the Calliope River. "Our grandparents had a beautiful home in Calliope, where we would swim in the river and collect eggs on the property," Stephanie said. It was so dear in the mind of Stephanie, she named one of her newborn identical twins Calliope. Husband Geoff Tichenor and his young family travelled a total of 28 hours to attend the event. "We wanted so badly to introduce the twins to their oma," he said. "She has inspired us with her marvellous disposition. She's a real reason to celebrate humanity and it's an absolute joy to be a part of this family." Arriving in Gladstone in 1968 to pursue work opportunities during the inception of QAL, the first of four generations, Corrie Engelston has lived a decorated life. Qualifying for the 1944 Olympic Games as an acclaimed swimmer, yet missing out on competing due to the cancellation of the event, it was a proud moment when Michelle Engelston followed in her grandmother's footsteps during the 2004 Olympic Games. Corrie, who still enjoys listening to Pavarotti each morning, is a beacon of strength for the entire family, winning a Queensland Premier's Award and acting as the impetus for bringing Guide Dogs to town. "She means so much to us as a family," Michelle said. "We are all so proud of her and proud of this moment."